The 1983 film was adapted for the stage by Tom Hedley and Robert Cary, with new music by Robbie Roth and lyrics by both Roth and Cary to pad out the soundtrack of rockin' 80s classics that add that feel-good jukebox touch. It opened in 2008 and after a regional tour of the UK transferred for a brief stint to London's Shaftesbury Theatre. The brand-new UK tour does not have a West End run booked in just yet, but if the impressive performance I saw at the New Wimbledon Theatre this week is anything to go by, it's more than ready to wow London audiences once more. The show focuses on Pittsburgh steelworker Alex Owens (Joanne Clifton) and her big dreams of getting into Shipley Academy, a professional dance school. But with money tight and no formal training she instead spends her evenings dancing at a club, working two jobs just to try and make ends meet. She has no patience for time wasters and so when the son of the owner shows up at the mills she works at acting like an idiot she's initially infuriated by him, however it doesn't take long for a romantic spark to fly between the two. But with Nick Hurley (Ben Adams) coming from a very privileged background, can the two make the relationship work? A romance between two people from different classes in society is far from an original concept, but set against the backdrop of a killer 80s score and incredible choreography, it's hard not to be swept away by Alex and Nick's story. Joanne Clifton may have risen to fame in Strictly Come Dancing, and her dance routines were most certainly among the highlights of the show, but she holds her own as a singer too, the at times husky deep tones of her voice mimicking the sound of 80s legends Cyndi Lauper and Pat Benatar. Ben Adams, former member of boy band a1, is less rocky and more poppy in his voice but when the two blend together, especially during their charming duet Here and Now, magic happens. The two biggest songs in the original film, What a Feeling and Maniac, were of course pivotal points in the musical, repeated perhaps one too many times, but alongside rock classics such as Gloria and I Love Rock 'n Roll I was hugely impressed by the new songs that had been created to turn the story into a fully-fledged stage show. In addition to the aforementioned Here and Now, another catchy stand out was Where I Belong, the deserving solo of the side-kick friend who returns from a disillusioned trip to NYC where he tried to make it big as a comedian. The song is sweet, funny and delivered with gusto by Colin Kiyani who grabs his deserving moment in the spotlight with both hands. And I especially loved how the new songs so seamlessly fit into the original score, capturing the 80s vibes perfectly. Flashdance may be mostly known for its one breathtaking dance sequence but it's so much more than that; it has a charming, feel-good story, wonderful characters and a killer soundtrack that has managed to fill the 80s-shaped hole in my life left after Rock of Ages closed. I do hope this isn't the last we've seen of this show in London as its current incarnation is definitely worthy of a West End transfer! 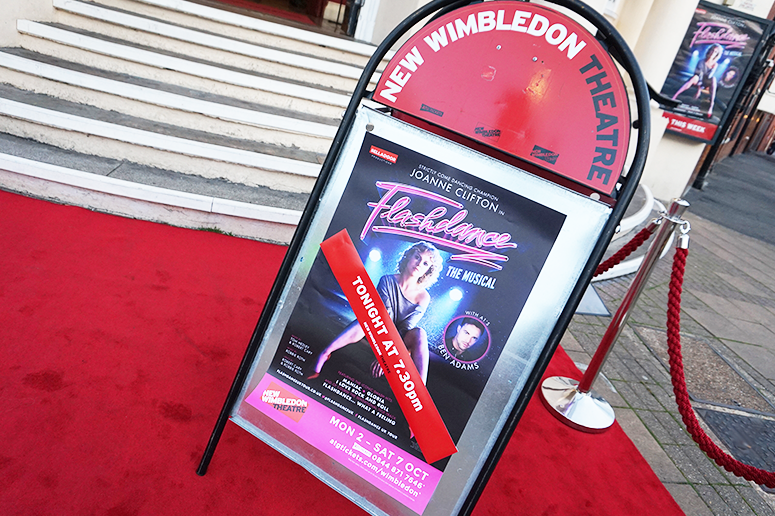 Flashdance is playing at the New Wimbledon Theatre in London until Saturday, 7 October after which it'll be touring the UK until 21 July 2018. Check out the official website for a full list of locations and to book your tickets.